WASHINGTON, DC, July 17, 2012 (ENS) – Thousands of temporary federal firefighters working on wildland fires across the country, and their families, now will have access to the same health insurance afforded to full time federal employees. Today, responding to a direction from President Barack Obama, the federal Office of Personnel Management, OPM, published an interim final regulation that extends eligibility for health insurance coverage under the Federal Employee Health Benefits program to temporary firefighters and fire protection personnel. Many federal firefighters are temporary employees because of the seasonal nature of their work. Under previous regulations, they were not eligible for health insurance coverage under the Federal Employee Health Benefits program, which provides insurance to other federal employees, retirees, and their families. Under the rule change, the FEHB program will officially be extended to federal firefighters and fire protection personnel temporarily employed to respond to wildland fires. OPM worked with the Department of Agriculture and the Department of the Interior, the two agencies that employ our nation’s wildland federal firefighting force, to establish a simple, expedited process for firefighters to gain access to coverage. They will have the option to purchase FEHB health care coverage while they fight fires, with the option to continue their coverage at their own expense when they return home. 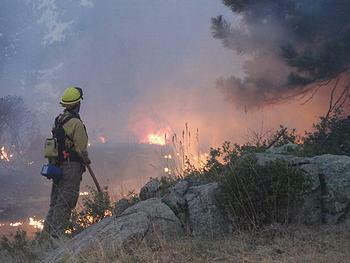 Since January, firefighters have contained 32,920 large fires that burned 3.68 million acres. Seven large fires were contained in the past 24 hours alone. Four states reported new large fires within the past 24 hours. Firefighters are currently working to contain 22 large fires covering 606,163 acres, including the largest fire in Oregon history, the Long Draw fire, which has scorched 582,313 acres. As wildfires break out, the federal government has a critical need to hire and quickly deploy qualified firefighters and other fire protection personnel. “Firefighters face unique hazards and risks to their health. The day-to-day job of a firefighter involves frequent exposure to environmental risk factors that can precipitate the onset of severe and lifethreatening diseases like cancer,” said OPM in its interim final rule. “The nature of this work necessarily involves intense physical stress that can result in potentially fatal cardiac events, job related injuries, and an adverse psychological impact,” the OPM said. Although firefighters are eligible for worker’s compensation for injuries suffered on the job, they have “a heightened need for health insurance coverage, so that they can obtain preventive care and benefit from early detection of the chronic and life-threatening conditions from which they face increased risk,” the OPM said. There is a 60 day comment period for the public to provide feedback on the new regulations. Submit comments using the Federal eRulemaking Portal: http://www.regulations.gov.